As has been announced in the press, funds have been authorized for the construction of a new school building to serve the children of families who either now reside on the reservation or who will reside here when housing facilities are provided. The authorities are being urged to place this school on the reservation in order to make it convenient for the children and to enable the use of modern plumbing and lighting facilities which cannot be procured if the school is located elsewhere. It is expected that this school building will be available for use by January 1 or before. In the fall of 1942 the work of construction at B.H.O.D. was in full swing. With little housing available, practically all workers lived off the area. The problem of schooling which presented itself was handled by the Provo School District, by the transportation of children by bus to the Edgemont schools and to the two-room schoolhouse at Provo. Both schools ran on a two-session basis with two sets of teachers. By the fall of 1943 a six-room grade school was completed. This was used to house the high school. 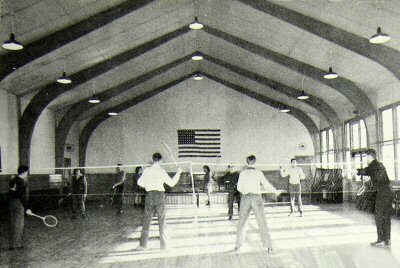 The grades were housed in available buildings on the depot, in CCC Barracks, and in the Provo schoolhouse. Over 550 children were enrolled during the school year 1943-1944. 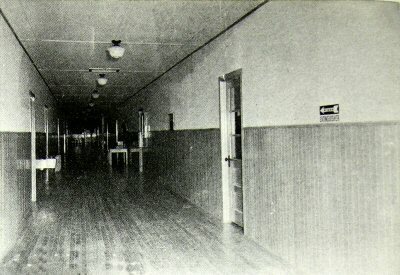 The fall of 1944 saw a new $152,000.00 building added to the original six-room structure, the two providing adequate housing for the grades and high school. The enrollment for 1944-45 is approximately 700. The personnel in 1944-1945 consists of sixteen grade teachers, a kindergarten teacher, a full-time music teacher, a combination office clerk and substitute teacher, one part-time band instructor, six high school teachers, and the superintendent. A nurse and a truant officer visit the school daily to assist in the checking of disease and as an aid to homes in which both parents work. All teachers are properly certified by the State Department of Education and are enrolled 100% in the South Dakota Education Association. The high school is a four-year school accredited by the South Dakota State Department of Education since its beginning in 1943. All of the usual high school subjects are taught; English, Latin, history, mathematics, including elementary and advanced courses; science, including general science, physics, chemistry; commercial courses consisting of business training, bookkeeping, typing I and II, shorthand, economics, sociology, international relations, public speaking, government, citizenship, and the like. Manual training and home economics are presented in well equipped departments. An adequate library is provided for both the high school and the grades. A recreation room provides suitable housing for ping-pong, badminton, monthly high school dances and parties. The boys enjoy football, basketball, and track. Intra-mural basketball, bowling, kitten ball and volley ball are arranged for the high school girls who belong to the Girl's Athletic Association. There is an active Pep Club, a "P" Club for boys out for athletics, a Home Ec Club, and a Dramatics Club. Both upper grade and high school pupils are organized in a school band. Girl's Glee Club, Boy's Chorus and a Mixed Chorus are available for the boys and girls interested in music. 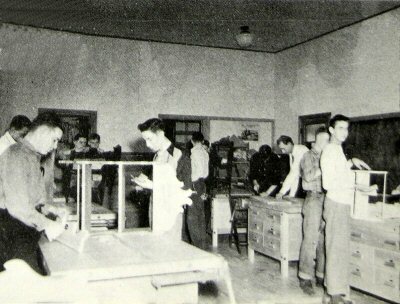 The Declam Group was host to the District Declam Contest in 1944, sending a representative on to the divisional meet. The Boys' Basketball Squad won the consolation finals in the District Tournament, losing their chance at the championship finals by two points. An Annual staff has produced two successful year books; a paper staff edits a monthly high school paper. A Student Council, representing the students and chosen by them, discusses all student and school problems with the superintendent. A fine school spirit exists, making for a happy school home for students while at B.H.O.D. Fourteen grade rooms are organized into Young Citizens League Groups, affiliated with both the state and national Y.C.L. The usual playground equipment is available for the lower grade groups. The upper grades are provided with the necessary equipment for kitten ball, loopa-ball and volley ball. The seventh and eighth grade boys have had basketball under the immediate direction of high school boys as coaches of the individual teams. An interclass tournament is played. The girls of these grades are organized into pep clubs. All grades have music three times a week. All grades participate in the publication of the grade school paper, put out each six weeks under the direction of the seventh and eighth grades. The Edgemont Tribune; Sept. 1, 1943; Provo School District gets Federal grants. $153,300.00 for construction and equipping of the new Provo School and $40,250.00 for the maintenance and operation of the school. The Edgemont Tribune; Sept. 17, 1947; 1947-48 school year, 377 enrolled, 107 high school and 270 grade school. Edgemont enrollment; 278 total, 90 HS, 188 Grades. Driver Education Offered at P.H.S. Drivers Education, under the direction of Mr. Garvis, is to be offerec as a one semester course. The subject requires two class periods a week and also two labs, in which the students do actual driving. Vision and reaction tests are required before taking the class. Mr. Garvis' main goal is to reach the class "sportsmanlike driving". In doing this the class will cover a book that contains general information on driving and the make-up of a car. The class will learn how to change a tire and proper signaling. There are approximately twenty students in the class. 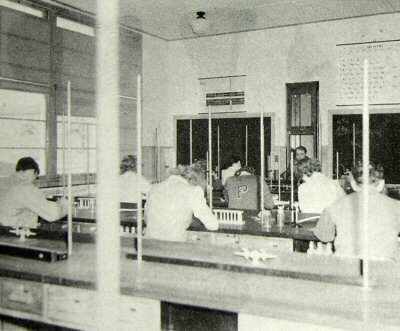 Each lab, is divided into groups of three. The school is purchasing a 1953 Plymouth for the use of the class. They will begin actual driving when it arrives. Provo High School students will start the school year on September 1st at 9:00 a.m. while the elementary students will begin Wednesaday morning the following day. Kindergarten will be held in the Community Building again and grades one throught eight, with the exception of Grade three, will attend the main building. Third Grade pupils will attend the Child Care Building. Approximately 100 students are expected in grade one, with a like number in Kindergarten. About 140 students are expected in high school. Estimated enrollment for Provo School will be 500 students in grades one through eight, 100 in kindergarten, and 140 in high school, a total of 740 students. One-third of these students are expected in grades two and below. Final plans for the new school building have not, as yet, been completed. Ewing and Forrette, the architects, report that they will be finished during August and ready for final approval. The school will not be completed until Spring of 1954. New desks have been purchased to replace the seating in grades four through eight, as well as for three recitation rooms in the high school. Painters are completing the interior decorating throughout the school. The walls have been painted a light green and the ceiling white. A school bus has been obtained from the Black Hills Ordnance Depot through the South Dakota Surplus Property Commission. The bus, a 37 passenger International, will be used for transportation for athletics, band, chorus and the like. Provo School enrollment soared to record heights with 758 students enrolling according to figues released by Supt. Sanford Witter. Largest influx of students was noted in grade one where 121 pupils began the school year with four first grade teachers. High school enrollment totaled 149 students. Elementary teachers for the various grades and the enrollment figures are as follow: Kindergarten - Mrs. Dorothy Garvis, Mrs. Jean Heer - 82 students; Grade one - Belva Hipsher, Mrs. Ruth Bohart, Mrs. Juliet Shedden, Miss Dorothy Lynn - 121 students; Grade two - Mrs. Nancy Frost, Mrs. Lorraine Lapinsky - 63 students; Grade three - Mrs. Elva Hurley, Mrs. Margaret Reeves, Mrs. Isabell Theisen - 72 students; Grade four - Mrs. Rachel Keane, Mrs. Maxine Syverts - 60 students; Grade five - Mrs. Geraldine Mann, Mrs. Dagney Bauer - 56 students; Grade six - Mrs. Willa Ritchey, Mrs. Madalynne Gisie - 56 students; Grade seven - Miss Lois Hermann, Mr. Paul Scissons - 53 students; Grade eight - Mr. Arnold Syverts, Mrs. Edna Hinrichsen - 46 students. Miss Christina Hajek is Elementary School Principal. High School teachers are as follows: Mrs. Helen Barney, Home Economics; Mrs. Lois Bemrohr, Commercial; Miss Lois Bowker, English, Spanish; Mrs. Mary Aderhold, English, Math; Owen Kluksdahl, Science, Math; Mr. Victor Garvis, Coach; Mrs. Bernadine Gayhart, English; Mr. Martin Gayhart, Industrial Arts; Mrs. Esther Little, Music; and Miss Adelaide M. Ward is high school principal. Mr. Anzie Swan, Mrs. Ida Swan and Mr. William Ruby are custodians and Mrs. Eva Pogreba and Mrs. Doris Smith are secretaries. Provo High School students elected their class officers and sponsors for the year. Sanford Witter, now experiencing the throes of highest academic achievement in working on his doctorate at Colorado State College of Education, was requested by the WALRUS to give our readers an informal report on the past school year. The ever-cooperative superintendent has taken time out from his scholastic chores to send us the following, for which the WALRUS and, we are sure, our readers are quite grateful. "Provo School enrolled 818 students last year and on any average day there were 662 students in attendance. With students leaving and entering we never at one time had 817 pupils, of course. The bulk of the students are in the lower grades with almost 300 being enrolled from kindergarten through grade three. Our new building, when completed, will be used for grades one and two. "The last census showed that we had 492 boys and girls between the ages of six and 21, a total of 1320 children. "Looking back over the past school year, it is possible to see many fine accomplishments and improvements. Among these are: accreditation of Provo School by the North Central Association, installation of the National Honor Society, winning second place at the state basketball tournament and third place at the state track meet, erection of a new elemetary school building, acquisition of a school bus and a new driver education car, addition of new books to the school libraries (now totaling over 3700 books), expansion of the film strip library, completion of new school desk program, many honors won by individual students and members of the faculty, and many other items. "These are but a few things of which the residents of Igloo and Provo may well be proud for such accomplishments are impossible without a forward looking school board, the active and intelligent interest and cooperation of the entire community, the assistance of the officials and workers of the ordnance depot, the professional labors of the faculty, and by no means least, the spirit of loyalty and hard work by the student body. By continuing to work together we shall try to continually improve the educational opportunities offered to our children for a sound education is not only absolutely essential, but is one of the few things we can give our boys and girls that can not be lost or taken away in these anxious times." 1953-54 school year, 817 students enrolled, 662 present on any given day, about 300 in Kindergarten thru Third Grade. The entire high school staff will return for the coming school year. This includes Mrs. Mary Aderhold, Mrs. Helen Barney, Mrs. Lois Beimrohr, Mrs. Lois Emery, Mr. and Mrs. Martin Gayhart, Victor Garvis, Owen Kluksdahl, Mrs. Esther Little and Miss Adelaide Ward. In addition to these will be Miss Selma Thompson, a graduate of Black Hills Teachers College and a major in Girls Physical Education and Mr. Raymond Reed, also a Black Hills graduate, and an instructor in math, science, and driver education. Provo school enrollment statistics reveal a drop in registrations in both high school and elementary school. Superintendent Sanford Witter revealed today. Thirty-four freshmen enrolled in high school, 41 sophomores, 35 juniors, and 33 seniors for a total of 143 students in high school compared to 149 last year. The elementary enrollment totals 554 pupils, broken down as follows: kindergarten, 84; grade one, 78; grade two 96; grade three 49; grade four, 54; grade five, 52; grade six, 46; grade seven, 51 and grade eight 44. Provo school enrollment is about the same as last year, as over 700 students registered the first few days of school. The high school enrollment remained at 145, while the grades registered 560 students. The teaching staff for the year includes 11 new teachers whose homes are listed after their names. Grade teachers are: Kindergarten - Mrs. Dorothy Garvis and Mrs. Jean Heer; Grade One - Miss Opal Dell, Crawford, Nebraska; Mrs. Ruth Bohart and Mrs. Juliet Shedden; Grade Two - Miss Delores Alger, Custer, Miss Ila Mae Gudath, White River and Mrs. Lorraine Lapinsky; Grade Three - Mrs. Louise Renz, Hot Springs, Mrs. Frances Spatz, Belle Fourche, and Isabell Theisen; Grade Four - Mrs. Margaret Howard and Miss Marilyn O'Neill, Wall; Grade Five = Miss Grace Bailey and Mrs. Willa Ritchey; Grade Six - Mrs. Madalynne Gisie and Mrs. Esther Six; Grade Seven - Mrs. Mary Aderhold; Mrs. Lanior is presently substituting in Grade Seven; Grade Eight - Miss Lois Hermann and Mr. Paul Scissons; Instrumental Music - Mrs. Dagney Bauer; Grade Principal - Miss Christina Hajek. High school teachers are: Mrs. Beverly Ecklund, Beresford - English and Girls Physical Education; Mr. Hartley Spatz, Spearfish - Commercial; Mr. Ernest Cetto, Lead - Biology and General Science; Mrs. Lois Emery - English and Library; Mr. Jack Ecklund, Sisseton - Social Science and Physical Education; Mrs. Bernadine Gayhart - English and Social Science; Mr. Martin Gayhart, Industrial Arts and Physics; Mr. Ray Reed - Mathematics and drivers Education; Mrs. Helen Barney - Home Making and General Science; Mr. Charles sqanson, Lead - Instrumental music; Miss Adelaide Ward - High School Principal; Mr. William Ruby - Chief Engineer; Mrs. Eva Pogreba - Secretary; Miss Bonnie Terry - Secretary and Mr. Sanford C. Witter - Superintendent. The Walrus; Sept. 19, 1957; 1957-58 school year, Enrollment Figures Show 590 Pupils In Provo School; School is now in full swing with an enrollment of 462 in the elementary grades and 128 in high school. The enrollment by grades is as follows: Kindergarten, 40; First Grade, 56; Second grade, 58; Third Grade, 63; Fourth Grade, 62; Fifth Grade, 65; Sixth Grade, 39; Seventh Grade, 47; Eighth Grade, 32; Ninth Grade, 36; Tenth Grade 33; Eleventh grade 33; and Twelfth Grade, 26. Provo School Officials have announced the appointment of Mr. George Bain, elementary school principal to fill the vacancy created by the retirement of Miss Christina Hajek. Mr. Bain earned his BA degree at the University of South Dakota and has since studied at Columbia University, Black Hills Teachers College and South Dakota State College, where he participated in a National Science Foundation program last summer. He has been a class room teacher for twenty years, having taught in Burns, Wyo., and Buffalo Gap, as well as in the Provo School. He was teaching mathematics and science on the Provo High School faculty at the time of his appointment. In the field of administration Bain has serviced as Deputy County Superintendent of Schools in Fall River County, Superintendent of Schools in Buffalo Gap, and Provo High School Principal in Igloo. Replacing Bain on the High School faculty is Mr. Arien Simonson of Leola who earned his BS degree at Northern State Teachers College in Aberdeen. His wife and two children will join him in Igloo after the holiday vacation. Fall River County Pioneers, 1976; pages 313, 314 and 315; PROVO SCHOOL; By September of 1912 a town hall had been built in Provo. It was to be used as a schoolhouse, church, for township meetings, elections, parties, lieraries, educational meetings, and also for dances. School started just as soon as everything was ready for it. The first teacher was Mrs. Curt (Lora) Wilson. She rode horseback 4 1/2 miles from her home southwest of Provo. Some of the first students were; Joe Trotter, Ruth Trotter, Clarence Calland, Herrick Coates, Doris Coates, Margaret Wilson, Laura Munroe, Glen Munroe, Theo. Clements, Ruby Clements, and Clarence crowe. The Provo school remained a one-room school, with ten to 15 pupils, until the government started to build the ammunition depot, later called Igloo. Previous to October 1941 the land later included in the Black Hills Ordnance Depot was privately owned ranch land in Fall River County, South Dakota. In October 1941 work was begun by surveyors for the actual construction. The engineers arrived on Jan. 21; the area was taken over by the Ordnance on May 6, 1942. The work involved in the setting up of such a project necessitated many workers. As the fall of 1942 approached, the problem of schooling the children of the many workers presented itself. After conferring with Miss Genevieve Frawley, Fall River County superintendent of schools, John Hines, state superintendent of public instruction for South Dakota, and T. S. Lillehaugen, the senior specialist on school facilities of the United States Office of Education, prevailed upon the Provo School District and the Edgemont School District to care for the schooling of the children. Miss Adelaide Ward was hired on Sept. 5 as coordinating supervisor to directly oversee the grade school at Provo and the transportation problem of children traveling to Edgemont. The Provo School Board at this time, and for several years, consisted of Joe Trotter, Mark Dunbar and Charley Stearns. The Edgemont School began on a two-session basis with two sets of teachers. Miss Christina Hajek taught in Edgemont, commuting from Provo to Edgemont to supervise the school busses. At one time over one hundred children were being transported to Edgemont at a cost of $1,000 every twenty days. Later the B. H. O. D. busses provided transportation. Previous to the location of the ammunition depot near Provo, the Provo School had an enrollment of about ten to fifteen. In anticipation of the increase in enrollment, the board had moved in the Soft Water Schoolhouse attaching it to their own one-room building. On registration day, Sept. 14, only one room was ready. By the following day desks had been procured; as many texts as possible were gotten through the office of the county superintendent; and Ada Rickenbach and Miss Ward were the teachers of these two rooms the first three months. 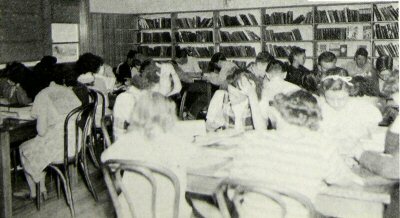 All eight grades were taught with an enrollment of 65 to 70. In addition, Miss Ward supervised the entire overall school problem. Difficulty over busses and a decrease in the number of children necessitated a change in plan, and in December of 1942 no more children were transported to Edgemont, for a time. The Provo school sent on a double shift; the thrid, fourth, fifth and sixth grades attending from 8 a.m. to 12 noon with Miss Hajek and Miss Ward as teachers. Grades one, two, seven and eight, under Ada Rickenbach and Lucille Anderson were in school from 1 p.m. to 6 p.m. 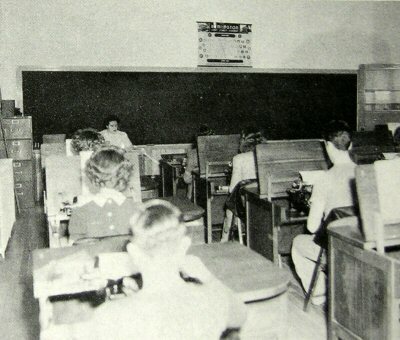 Both sessions having to use the same desks; orange crates were set up to serve as makeshift lockers in which pupils kept their books and supplies when not in school. A renewal of construction on the area resulted in an increase of workers. The enrollment again necessitated the transportation of some pupils to Edgemont. This transportation was provided by the Ordnance. In April of 1943, Col. Keith, C.O., State Superintendent Hines, the Provo Board, Mr. Lillehaugen, Attorney Lewis and Miss Ward met in Hot Springs for the purpose of formaulating plans by which the Provo Board would handle the school problem for the area. A temporary budget was drawn up at that time for a grade and high school. Upon learning that the depot land had been ceded to the U.S. government, and therefore no longer lay in the State of South Dakota, the Provo Board was loath to assume the burden outside their own district. When after several weeks it appeared impossible for Col. Keith to obtain Lanham Act Funds in any other way, the Provo Board finally agreed to assume the resposibility for a school to care for the children of the area as well as those of their own District 25. (Note: Mr Lanham, in setting up his bill providing funds for impacted areas due to war, had specified that none of these funds were to be administered by the U.S. Army, or by civilians living on an army post). The board immediately made application for additional school housing and an operating fund. Weeks went by with no action by the government on the application for funds. In July Miss Ward was hired as superintendent. From then until late August every possible department was appealed to bring about the definite provision of buildings and funds. In the meantime teachers were contacted (but not contracted); texts and supply orders were made out and filed with companies subject to confirmation by wire; a school district election was held to legally register the wish of the district for a high school. Finally President Roosevelt returned to Washington, D.C., from his conferences in Canada with Winston Churchill; the necessary papers were signed and our money and a school were assured. Some weeks later the board was notified that their request for additional housing had been allowed; $152,000 of Lanham Act Funds having been appropriated for a building to be constucted under the supervision of the P. B. A. The problem of immediate housing still facing us, it was decided to use the existing new grade school building for a high school since it was not large enough for all the grades, and was more adaptable to high school than any other building available. Eighty-two students and six high school teachers used this building; 41 9th (sec) grade pupils and their 15 teachers went to school in seven different buildings on the depot and the two-room school house in Provo. Sixteen pupils graduated that first year. 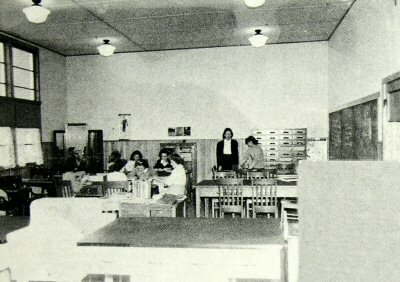 September 1944 saw a new $152,000 building added to the original six room structure. 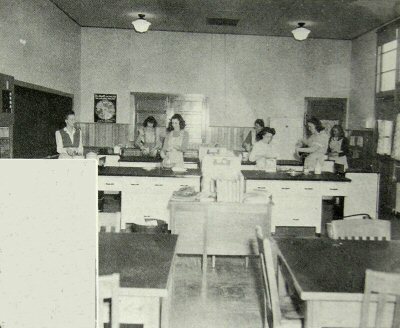 The enrollment for 1944-45 was approximately 700 with a faculty of 16 grade teachers, a kindergarten teacher, music teacher, nurse, truant officers, a part-time band instructor, six high school teachers and the superintendent. Enrollment that September was amidst, and despite, hammers and saws as the building was completed the day of registration. In 1954 a permanent-type seven room addition, costing $153,000 was erected for kindergarten and elementary use. 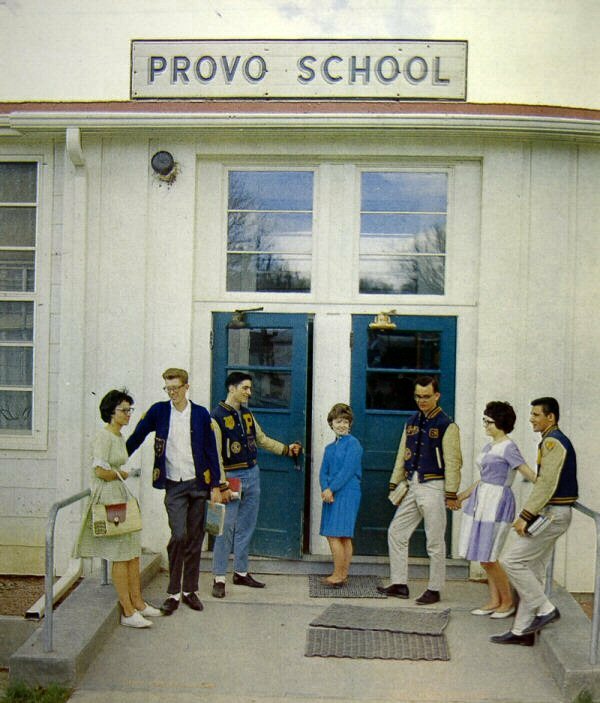 Especially in its earlier years, Provo School was a typical American melting pot with students from many states; from big city schools and country one-room schools; from a great variety of cultural and economic backgrounds. Some pupils had attended as many as seven different schools in one year, while many attended their 13 years in the Provo School. Yet quickly was forged a spirit of unity and loyalty which made Provo School dear to the hearts of its pupils and alumni as is indicated by their desire, when Igloo was closing that their athletic trophy case, composite pictures of each graduating class, a copy of each year's annual, their school banner and much more memorabilia be housed in one room in the Fall River County Museum in Hot Springs, where they could be visited by them when back in this area; and the Provo alumni reunion held in Rapid City the third Saturday in July each year since the school closed. The following day (Sunday) pupils, parents and old Igloo neighbors meet for a picnic in a Rapid City Park. Hundreds attend as do ex-Iglooites in similar reunions in Hot Springs, California, Colorado and Texas. In its first formative years, Provo High School had an average enrollment of 140 with an average grade enrollment of 600. After the close of the war the area population decreased, as did the school enrollment. In its 25 years the school graduates numbered 550. The original school board of Provo District No. 25 consisted of Mark Dunbar, Charley Stearns and Joe Trotter. Others to serve in later years were Wayne Jackson, Merle Roselus, Mrs. Georgia Shuck, Mrs. Velda Bishop, Mrs. Sadie Hoar, Vince Wasserburger, Clinton Caylor and John Chlecq. In addition, an area committee of three Igloo residents met with the board. Provo District No. 25 administered the school affairs as a common school district until 1956, after which it functioned as Independent District No. 36, having been joined by Ardmore, Roller, Rumford, Plains, Hat Creek, Eckard and Duck Creek. The monies for the school came from the U.S. government, the usual tax sources of Provo District No. 36, the county and the state of South Dakota. At the close of the school Senator Francis Case had a tribute to Provo School made a part of the Congressional Record. At the close of B. H. A. D. in 1967, Provo Independent District became, by vote, a part of the Edgemont District No. 40. NOTE: Materials for this article were taken from articles written by Miss Ward; excerps from the Rapid City Journal, S. D. E. A. Journals and from the National School Executive.